How to Repair a Pond Leak. 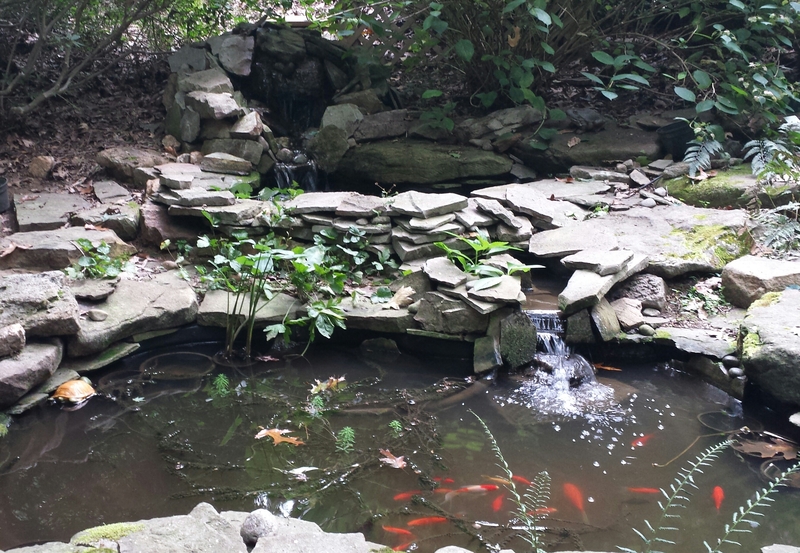 Ponds with flexible or preformed liners will invariably leak. It’s just the nature of a pool of water to try to find its way out. 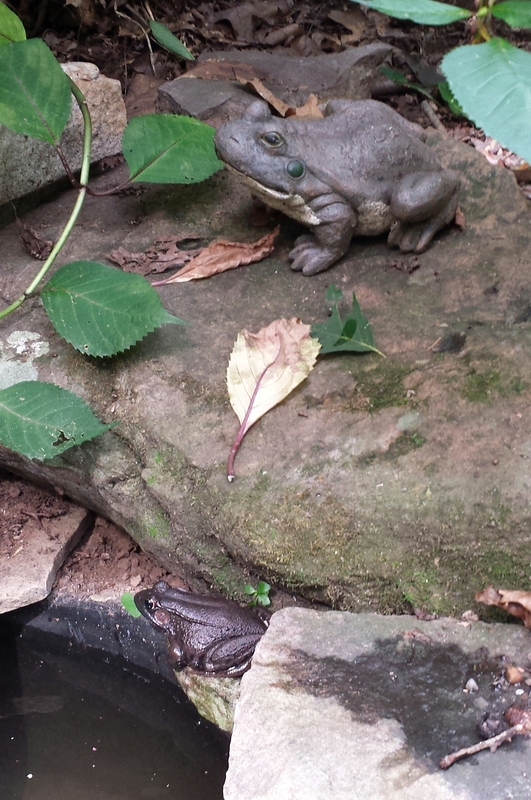 Tree roots and ground-inhabiting rodents can poke holes in a pond liner. 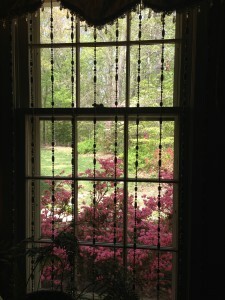 Also, shifting of the ground behind the pond walls can cause stress cracks or tears in the liner. Pond tubing and hoses can develop leaks as well. 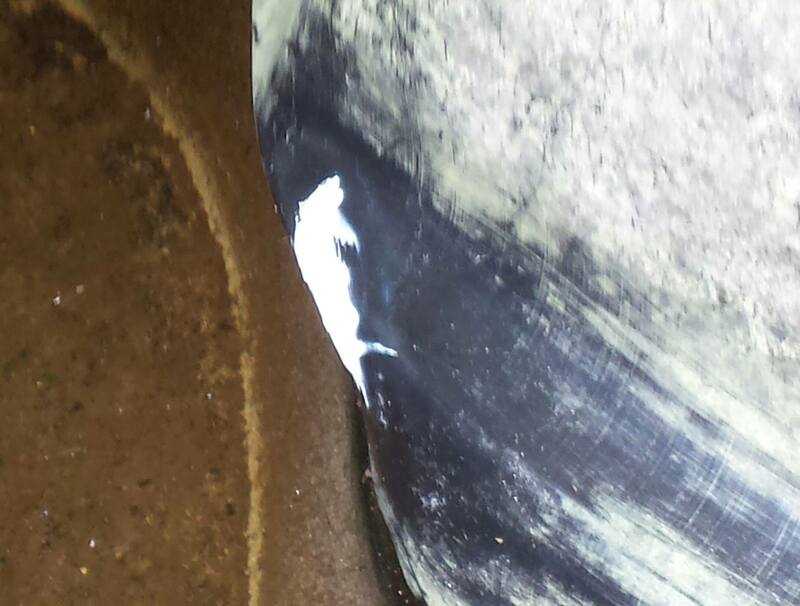 After 7 years, one of my preformed hard PVC pond shells started to leak…and I FIXED IT! 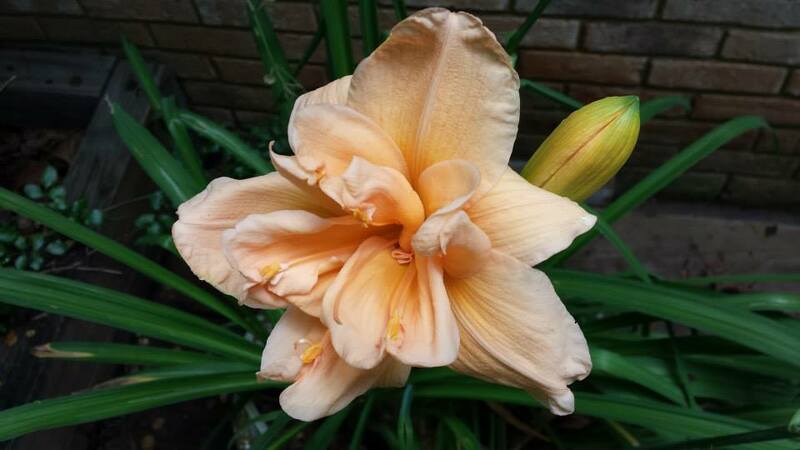 In this posting, I will tell you how to repair a pond leak like mine. I installed my two back ponds in 2008. Check out my Ponds Project posting for more information. My husband and I spent a few weekends digging holes, setting the preformed pond liners, and filling in behind the pond liner walls. Over the years, a stress crack formed in the deeper top pond right along an area where a pond shelf juts out from the pond wall. It’s interesting because our neighbors’ pond started losing water the exact same timeframe that mine did! We wondered if some sort of small seismic earth movements had caused the leaks. So how did I repair the pond leak? First I had to find it. 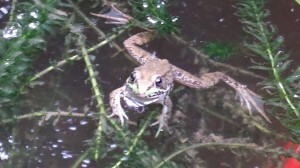 I couldn’t figure out why the pond was losing water. This pond has a waterfall so my first thought is that water was leaking out of the rubber hose that leads the water from the pond to the waterfall. I was really hoping that wasn’t the case because that would have meant dismantling a lot of rocks to check the hose. I turned off the pond pump. 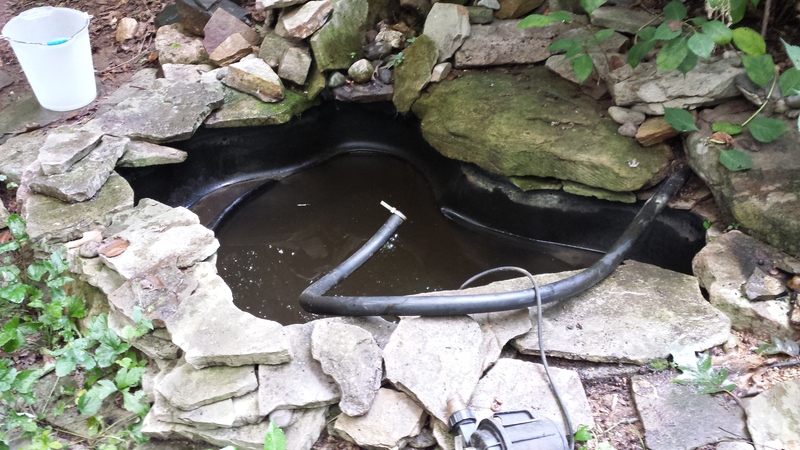 Then, I removed the pump and its filter and pulled the waterfall hose out of the pond. Let that go a few days and the pond was STILL losing water. Well, it clearly wasn’t the waterfall hose. Hmmmm…. I didn’t see any cracks or other damage. This pond is 24 inches deep, so I removed some of the pond water to an unused whiskey barrel pond hard liner to serve as temporary housing for the fish. Then, it was time to catch the 10 Shubunkin and Comet goldfish that were inhabiting the pond. I was able to catch them all, including a stray frog that hadn’t yet gotten out of the pond. 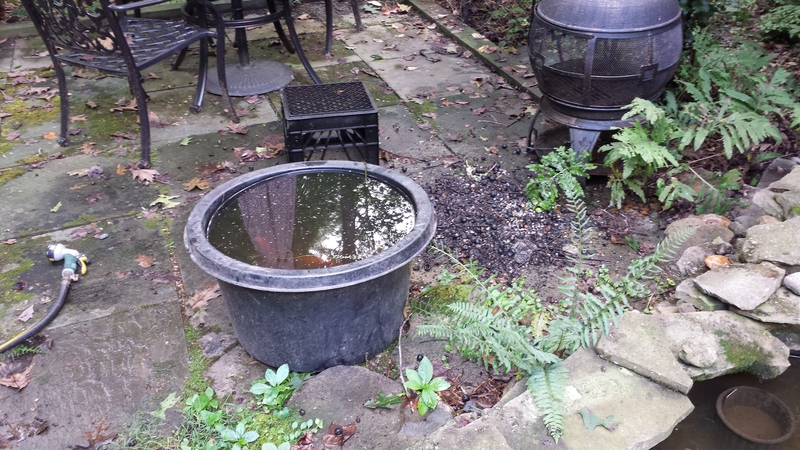 After the fish were safely in the whiskey barrel pond, I put some pond mesh over it to protect them from predators. Then, I filled the pond back up to its usual level. 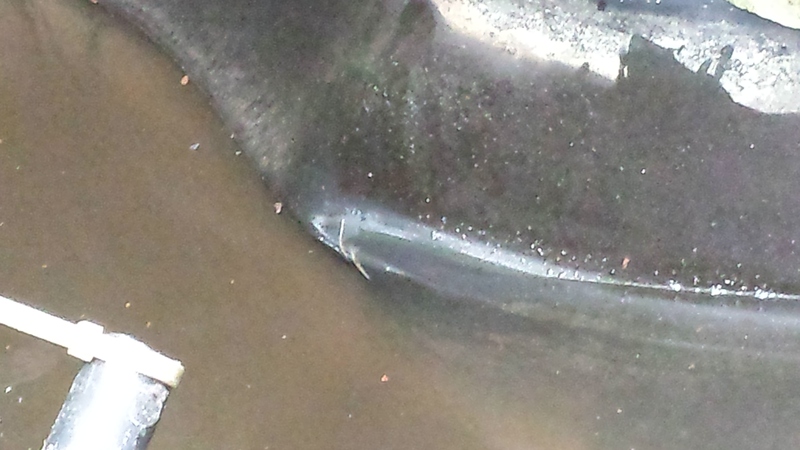 I let the water continue to leach out of the leaking pond and finally it stopped about halfway down. 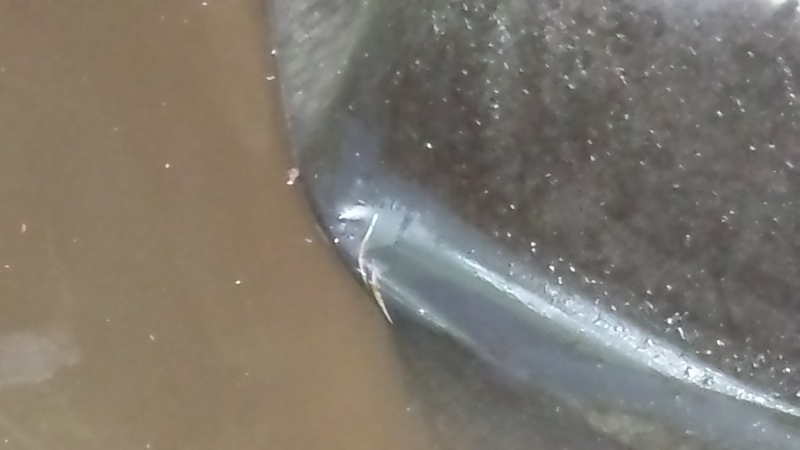 I removed a couple buckets of the water, and presto, there were not one but TWO cracks in the liner. And yes, the cracks went the whole way through. Just to be certain, I added water above the cracks, and within a few hours, the water level had dropped to the level of the cracks. Time to patch the cracks in the pond. 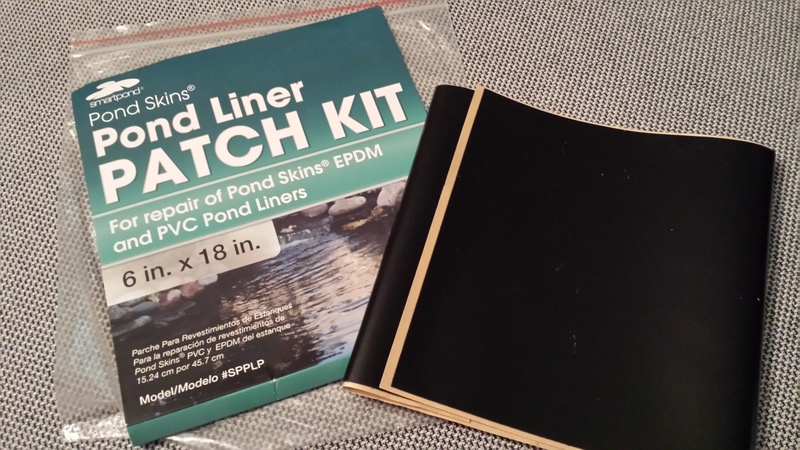 I headed out to Lowes to pick up some Smartpond Pond Skins pond liner repair patch kit. It states on the package that this patch is for both EPDM (flexible) and PVC (hard) pond liners. It’s a thick rubbery skin with adhesive on the back. There were no instructions with the patch kit so I went online to the Smartpond site. The site suggested to thoroughly clean the area around the cracks. I did that with a degreaser as well as some acetone. And let it all dry for about 6 hours. Then I cut a piece of the patch and applied it over top of the cracks. Because the cracks were not on a flat area, the patch didn’t adhere at all and came right off by itself within seconds of application. I’m sure the patch works on flexible liners but it did not work on my PVC preformed pond. The patch wasn’t flexible enough for the area that I needed to patch. Maybe it would have worked better with an adhesive but I didn’t want to bother with it. Strike One, and I didn’t want Strike Two. Let’s try something else. Then came the Internet research. In our garage, we already had several types of “repair” products including Loctite Marine Epoxy. I read and read about what worked, what didn’t, what to try, etc. I finally settled on Loctite Aqua Marine Epoxy . It’s a two-epoxy combination which you mix together and then it will bond to whatever you are trying to repair. 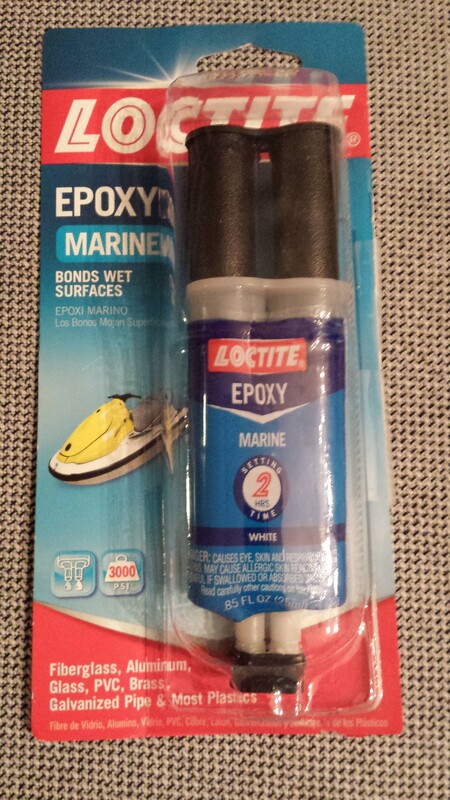 Many commenters on the various sites were saying not to use the Loctite marine epoxy to repair aquariums or ponds. 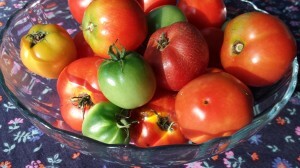 However, others said they’d done so with no ill effects to fish or other marine life. I figured I’d give it a try. I re-cleaned the area around the cracks and also cleaned the cracks and let it all dry for 6 hours. We were very lucky to have no rain for several days while I was playing trial and error with the pond leaks. I mixed the two-part Loctite marine epoxy together with a toothpick on a piece of foil-covered cardboard. Then I took a tiny art paintbrush outside with me to the ponds. I “painted” the epoxy into the cracks and made sure I covered the whole area. I made sure there were no air bubbles. I let that epoxy sit overnight. 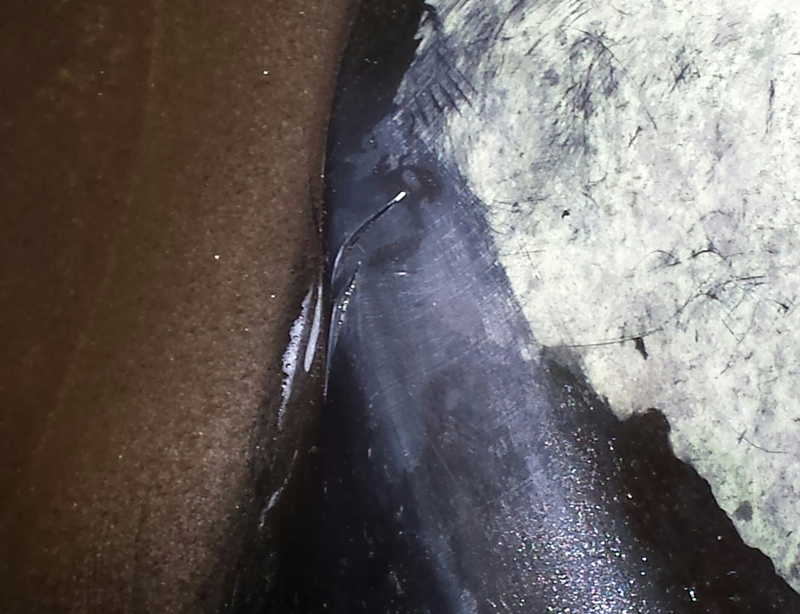 Pond Cracks with Epoxy applied! The next day, I mixed some more epoxy and put another coat over the first epoxy. Let that sit for another 24 hours. Then I filled the pond up about an inch above the epoxy patch. The water stayed in the pond! No leakage! I watched the water level for another 24 hours. No issues. So I put one fish back into the pond water. Remember that others had warned about toxicity of the marine epoxy and marine life. The fish was still fine and swimming around after 48 hours. 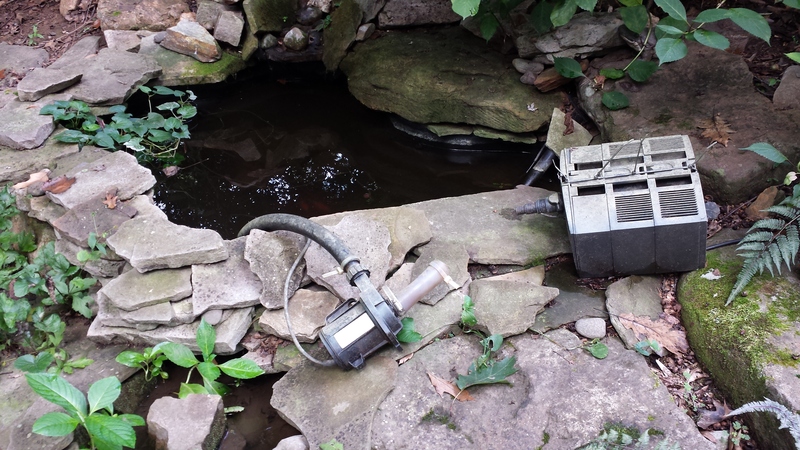 Next, I cleaned the fish filter and put it and the pump back into the pond. I let the waterfall run for 4 hours. No water loss. Great! 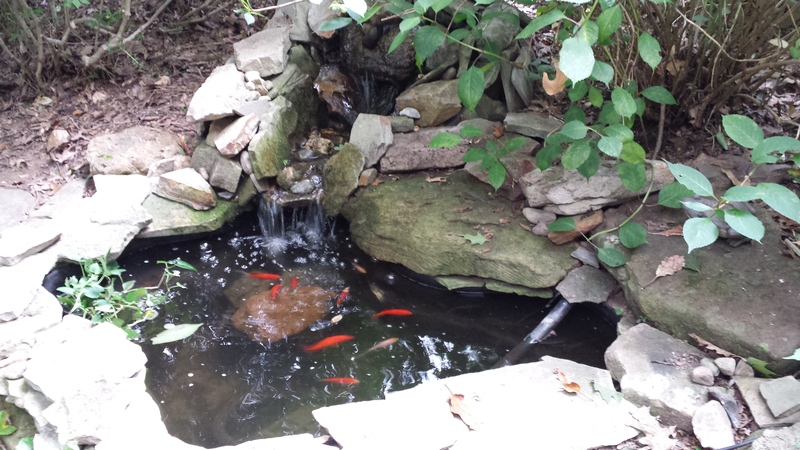 I put the rest of the fish back into the pond along with their previous pond water that was in the whiskey barrel pond. When you change out pond water, always try to leave at least 1/3 of the existing water in the pond so it keeps the pond ecosystem in check. Too many people try to clean out their ponds and add completely new water all too often. It’s just not good for the fish and other pond life. And, you might throw out some beneficial creatures such as dragonfly nymphs. The big frog is a spitter and part of a lilypad pond spitter set. The little frog is real! My preformed pond is manufactured by Maccourt. Their website notes a pretty good 20 year warranty on preformed ponds. Luckily for me, I do have my receipts for all of my pond materials. I’ll see whether my patch holds or whether I’ll need to pursue their warranty options. Another repair option is to cover the preformed pond liner with a flexible pond liner. The flexible liner will need to be larger than the preformed pond liner so it will overlap the edges of the pond. Otherwise you’ll have ANOTHER leak to deal with! Have you had any pond leaks? How did you repair them? Leave a comment and let us know! !